Queen Elizabeth II in right of the Crown. The original crown was a holy relic kept at Westminster Abbey, Edward's burial place, until the regalia were either sold or melted down after Parliament abolished the monarchy in 1649, during the English Civil War. The present version of St Edward's Crown was made for Charles II in 1661. It is solid gold, 30 centimetres (12 in) tall, weighs 2.23 kilograms (4.9 lb), and is decorated with 444 precious and semi-precious stones. The crown is similar in weight and overall appearance to the original, but its arches are Baroque. After 1689, it was not used to crown a monarch for over 200 years. In 1911, the tradition was revived by George V, and all subsequent monarchs have been crowned using St Edward's Crown. A stylised image of this crown is used on coats of arms, badges, logos and various other insignia in the Commonwealth realms to symbolise the royal authority of Queen Elizabeth II. St Edward's Crown is on public display in the Jewel House at the Tower of London. St Edward's Crown is 22-karat gold, with a circumference of 66 cm (26 in), measures 30 cm (12 in) tall, and weighs 2.23 kg (4.9 lb). It has four fleurs-de-lis and four crosses pattée, supporting two dipped arches topped by a monde and cross pattée, the arches and monde signifying an imperial crown. Its purple velvet cap is trimmed with ermine. It is set with 444 precious and semi-precious stones, including 345 rose-cut aquamarines, 37 white topazes, 27 tourmalines, 12 rubies, 7 amethysts, 6 sapphires, 2 jargoons, 1 garnet, 1 spinel and 1 carbuncle. Although it is regarded as the official coronation crown, only six monarchs have been crowned with St Edward's Crown since the Restoration: Charles II (1661), James II (1685), William III (1689), George V (1911), George VI (1937) and Elizabeth II (1953). Mary II and Anne were crowned with small diamond crowns of their own; George I, George II, George III and William IV with the State Crown of George I; George IV with a large new diamond crown made specially for the occasion; and Queen Victoria and Edward VII chose not to use St Edward's Crown because of its weight and instead used the lighter 1838 version of the Imperial State Crown. When not used to crown the monarch, St Edward's Crown was placed on the altar during the coronation; however, it did not feature at all at the coronation of Queen Victoria. Edward the Confessor wore his crown at Easter, Whitsun, and Christmas. In 1161, he was made a saint, and objects connected with his reign became holy relics. The monks at his burial place of Westminster Abbey claimed that Edward had asked them to look after his regalia in perpetuity for the coronations of all future English kings. Although the claim is likely to have been an exercise in self-promotion on the abbey's part, and some of the regalia probably had been taken from Edward's grave when he was reinterred there, it became accepted as fact, thereby establishing the first known set of hereditary coronation regalia in Europe. A crown referred to as St Edward's Crown is first recorded as having been used for the coronation of Henry III in 1220, and it appears to be the same crown worn by Edward. An early description of the crown is "King Alfred's Crown of gold wire-work set with slight stones and two little bells", weighing 79.5 ounces (2.25 kg) and valued at £248 in total. It was sometimes called King Alfred's Crown because of an inscription on the lid of its box, which, translated from Latin, read: "This is the chief crown of the two, with which were crowned Kings Alfred, Edward and others". However, there is no evidence to support the belief that it dated from Alfred's time, and in the coronation order it always has been referred to as St Edward's Crown. St Edward's Crown rarely left Westminster Abbey, but when Richard II was forced to abdicate in 1399, he had the crown brought to the Tower of London, where he symbolically handed it to Henry IV, saying "I present and give to you this crown with which I was crowned king of England and all the rights dependent on it". It was used in 1533 to crown the second wife of Henry VIII, Anne Boleyn – unprecedented for a queen consort. In the Tudor period, three crowns were placed on the heads of monarchs at a coronation: St Edward's Crown, the state crown, and a "rich crown" made specially for the king or queen. After the English Reformation, the new Church of England denounced the veneration of medieval relics, and starting with the coronation of Edward VI in 1547, the significance of St Edward's Crown as a holy relic was played down in the ceremony. During the English Civil War, Parliament sold the medieval St Edward's Crown, regarded by Oliver Cromwell as symbolic of the "detestable rule of kings". The British monarchy was restored in 1660, and in preparation for the coronation of Charles II, who had been living in exile abroad, a new St Edward's Crown was supplied by the Royal Goldsmith, Sir Robert Vyner. It was fashioned to closely resemble the medieval crown, with a heavy gold base and clusters of semi-precious stones, but the arches are decidedly Baroque. In the late 20th century, it was assumed to incorporate gold from the original St Edward's Crown, as they are almost identical in weight, and no invoice was produced for the materials in 1661. A crown was also displayed at the lying in state of Oliver Cromwell, Lord Protector of England from 1653 until 1658. On the weight of this evidence, writer and historian Martin Holmes, in a 1959 paper for Archaeologia, concluded that in the time of the Interregnum St Edward's Crown was saved from the melting pot and that its gold was used to make a new crown at the Restoration. His theory became accepted wisdom, and many books, including official guidebooks for the Crown Jewels at the Tower of London, repeated his claim as if it were fact. 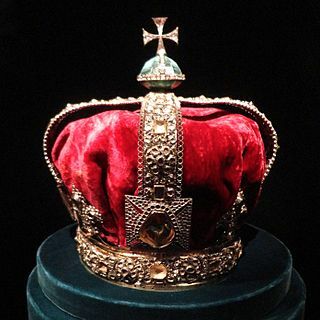 In 2008, new research found that a coronation crown and sceptre were made in 1660 in anticipation of an early coronation, which had to be delayed several times. His other regalia were commissioned in 1661 after Parliament increased the budget as a token of their appreciation for the king. The crown at Cromwell's lying in state was probably made of gilded base metal such as tin or copper, as was usual in 17th-century England; for example, a crown displayed at the funeral of James VI and I had cost only £5 and was decorated with fake jewels. In 1671, Thomas Blood briefly stole the crown from the Tower of London, flattening it with a mallet in an attempt to conceal it. A new monde was created for the coronation of James II, and for William III the base was changed from a circle to an oval. After the coronation of William III in 1689, monarchs chose to be crowned with a lighter, bespoke coronation crown (e.g., the Coronation Crown of George IV) or their state crown, while St Edward's Crown usually rested on the high altar. Edward VII intended to revive the tradition of being crowned with St Edward's Crown in 1902, but on coronation day he was still recovering from an operation for appendicitis, and instead he wore the lighter Imperial State Crown. Jewels were hired for use in the crown and removed after the coronation until 1911, when it was permanently set with 444 precious and semi-precious stones. Imitation pearls on the arches and base were replaced with gold beads which at the time were platinum-plated. Its band was also made smaller to fit George V, the first monarch to be crowned with St Edward's Crown in over 200 years, reducing the crown's overall weight from 82 troy ounces (2.6 kg) to 71 troy ounces (2.2 kg). It was used to crown his successor George VI in 1937, and Queen Elizabeth II in 1953, who adopted a stylised image of the crown for use on coats of arms, badges, logos and various other insignia in the Commonwealth realms to symbolise her royal authority. In these contexts, it replaced the Tudor Crown, which had been instated by Edward VII in 1901. Use of the crown's image in this way is by permission of the monarch. On 4 June 2013, St Edward's Crown was displayed on the high altar in Westminster Abbey at a service to mark the 60th anniversary of Elizabeth II's coronation—the first time it had left the Jewel House at the Tower of London since 1953. ^ The Royal Household. "The Crown Jewels". The Official Website of the British Monarchy. Archived from the original on 8 October 2015. ^ Kathryn Jones (17 December 2014). "Royal Gold: Reflections of Power" (Podcast). Royal Collection Trust. 13:03 minutes in. Retrieved 14 February 2018. ^ a b Rose, p. 29. ^ Mears, et al., p. 23. ^ H.R. Luard, ed. (1858). Life of St Edward the Confessor. Longman. pp. 215, 273, 281. ^ a b Keay, pp. 18–20. ^ Ronald Lightbown in Blair, vol. 1. pp. 257–353. ^ Alice Hunt (2008). The Drama of Coronation: Medieval Ceremony in Early Modern England. Cambridge University Press. p. 93. ISBN 978-1-139-47466-5. ^ Ronald Lightbown in MacGregor, p. 257. ^ Brian Barker (1976). When the Queen was Crowned. Routledge & Kegan Paul. p. 80. ISBN 978-0-7100-8397-5. ^ a b Barclay, pp. 149–170. ^ Graham Fisher; Heather Fisher (1979). Monarchy and the Royal Family: A Guide for Everyman. Robert Hale. p. 40. ISBN 978-0-7091-7814-9. ^ a b "Royal Crown and Cypher". Government of Canada. Canadian Heritage. Retrieved 3 December 2016. ^ a b Rose, p. 35. 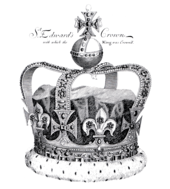 "St Edward's Crown". Royal Collection Trust. Inventory no. 31700. The Jewel House is a vault housing the British Crown Jewels in the Waterloo Block at the Tower of London. It was opened by Queen Elizabeth II in 1994 and refurbished in 2012. Regalia have been kept in various parts of the Tower since the 14th century after a series of successful and attempted thefts at Westminster Abbey. St Edward's Sapphire is an octagonal, rose-cut sapphire that forms part of the British Crown Jewels.